This army is for IV/1a, the army under the first two emperors of the Komnenan Byzantine dynasty, Alexius and John. I suppose it could also cover IV/1b, but I find the idea of 3Kn for Kavallarioi less interesting than 3Cv. The figures are from Outpost Wargames Services. They are somewhat variable, especially in scale, and in time I may get figures for this army from Khurasan. This army underwent major changes from its predecessor following the defeat at Manzikert. It relied very heavily on mercenaries. We also have the fascinating account of this period from the daughter of the first emperor, Anna Comnena. 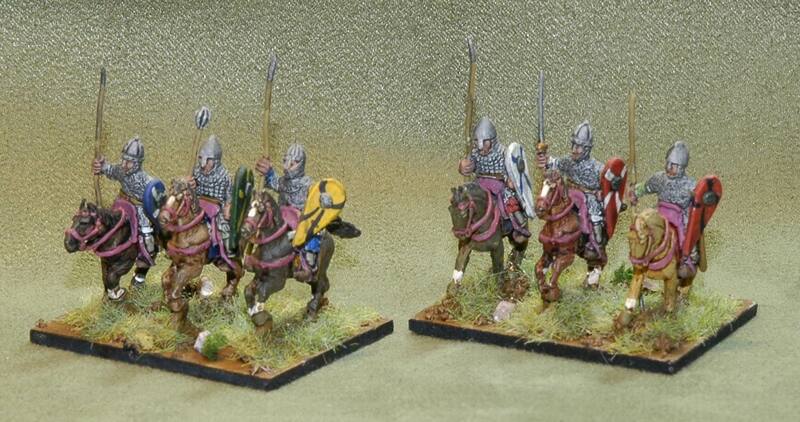 Like all the Byzantine armies this is a strongly cavalry army with two thirds of the army mounted. The core is four elements of Kavallarioi (3Cv), including the commander. These were still regular units. The Emperor and his Kavallarioi. The spears were so thin that I succumbed to the temptation to drill them out and use Xyston spears. As this was my first attempt at such a job, and as I didn’t have any magnifying glasses to help me, the results were somewhat variable! The flag is probably not entirely historical, though legend associates this eagle with the Komnenans, and it looks nice! The two main mercenary bodies were the Skythikon and the Latinikon. The Latinikon represents Frankish mercenaries (3Kn), and in this list comprises only one element (though I’ve got two painted!). The other mercenary body consisted of light horse (2LH) recruited from a number of steppes peoples. In this period, the Pechenegs were very popular, as were the Turks. There is also record of a unit of Turkopoloi, or sons of Turks, who seem to have been more regular. These are represented as being more uniform and having armour. The Skythikon and other light horse: an element of Turkopouloi, another of Turks and two elements of Pechenegs. The foot options of this army start with the most famous of the Byzantine mercenary units, the Varangian guards (4Bd), recruited from Scandinavians, and in this period increasingly from English, presumably from that section of society that lost status under the Normans. The Byzantines also fielded quite a few archers, whether in close formation (4Bw) or as skirmishers (2Ps). They occasionally had some spearmen (4Sp), and some Manichaeans (3Ax). Byzantine foot: Varangians, Manichaeans and skirmishers. This army is a big change from my other foot-heavy ones, and I’m looking forward to exploiting its mobility and to fielding the massed archers backed by the Varangians. The second element of skirmishers, the Kontarioi and the camp. Very nice Mark. The Outpost figures react well to the ‘detailing wash’ and I do like the realistic equipment they’ve given the Latinikon. I don’t think I’ve used mine yet, which is a shame, but the guy who used my Komnenans against me certainly had a lot of fun! Thanks, they aren’t terrible figures, just fiddly to paint and variable in size. This is the army I hope to take to the IWC, so I’ll be using it a lot in the next while. they look nice, a nice mobile army and with the personality of Alexios I in the army. except the frankish and norman Knights at this time was also atleast in one occasion hired German kn, in the Pecheneg war, giving a more option to someone to depict them insted of Normans if it wants. The monks are nice touch, but i think, Orthodox priests and monks wear black robs. The knights were what Outpost made for their Crusader range. If I ever do this army with Khurasan figures, I’d probably go for similar ‘Italo-Norman’ figures just to differentiate them from Norhern armies. You’re right about the priests. but they started life as an element of Clerics for HOTT, and haven’t been repainted!